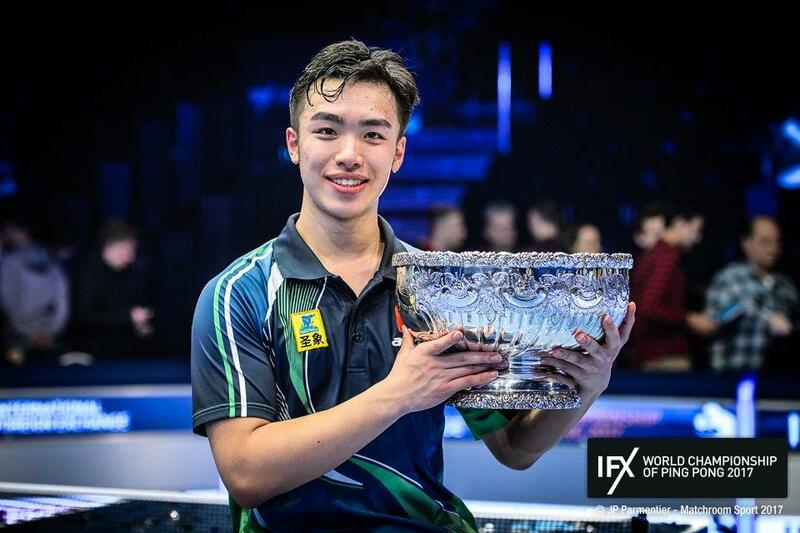 In front of a 1,200 strong vocal crowd at the Alexandra Palace, a new name was etched on the prestigious IFX World Championship of Ping Pong trophy as Yan Weihao of China defeated Germany’s Alexander Flemming to become the first Asian to win the title. The 20 year-old from Nanking had battled through the tough Last Chance qualifying event three days before the tournament proper and came through a Sunday evening where strength, endurance and mental resilience were key. The final looked set to be a classic as they shared the first two games to leave it evenly poised. However, Yan had too much for Flemming as he closed out the match for a 3-1 win to land the trophy, the title and a $20,000 pay day. “I am very tired but I was always confident that I could win the game,” said a jubilant Yan. “I have only been playing sandpaper ping pong for six months so I didn’t know how much skill I would have compared to the other players but I wanted to come here and enjoy the moment and see how well I could do. For Flemming who seemed to be suffering from some cramp in the final, it was a second runner-up spot in the event as he lost at a similar stage to Andrew Baggaley in 2015. Earlier in the semi finals, the 29 year-old from Leipzig had defeated Slovakia’s Lubomir Pistej to earn his second championship match but nothing could prepare him for the heartbreak of a second final defeat. “Of course, I don’t feel good right now. I have had some great matches here but in the end maybe I was not fresh enough; I started to get some small cramps but that is part of the game and he was fitter than I was and he deserved to win. “I had some bad luck but it is part of the game and I got too angry about it and annoyed myself. Usually I stay calm and take it how it is. The IFX World Championship of Ping Pong is now in its sixth year and takes place at the iconic Alexandra Palace in London. With qualifying events taking place all over the world, there are in excess of 25 nations represented. The event had got underway on Saturday afternoon with 64 players competing down to 32 in a double elimination format. Former bronze medallist Andrew Rushton (England) was the most noticeable name to fall by the wayside in the first round, while the Chinese had the biggest representation in the last 32 with seven players while Russia with four and the Philippines and Slovakia with three apiece were also in the mix. With a draw instigated at the last 32 stage it meant that the better players were more likely to meet each other earlier. Seven of the last eight quarter finalists last year were the same as in 2015, but this time it was down to four. Notable casualties in the round of 16 were the two men who have dominated this event in its five year history. First Maxim Shmyrev, the three time champion of this event, went out two games to one to Chinese sensation Yan Weihao and then Andrew Baggaley (England) was beaten by a similar scoreline at the hands of Lubomir Pistej the Slovakian. The last eight consisted of two Spaniards, and one each from China, Russia, Philippines, England, Slovakia, and Germany. Chris Doran, the last remaining home hope went out in straight games to industrious Spaniard Duran who went onto meet China’s Yan who put out the other Spaniard, Oriel Monzo out of the competition. The bottom half of the draw saw Alexander Flemming defeat Filipino Richard Gonzales while Lubomir Pistej of Slovakia put paid to Russian hopes with a 2-1 win over Vladislav Kutsenko.